Results for - Comedy Or Creepy? 1. Do you take a yearly traditional family Christmas photo? 2. One family had its sights firmly set on hilarity when they posed for their annual happy snap, but not everyone's laughing. 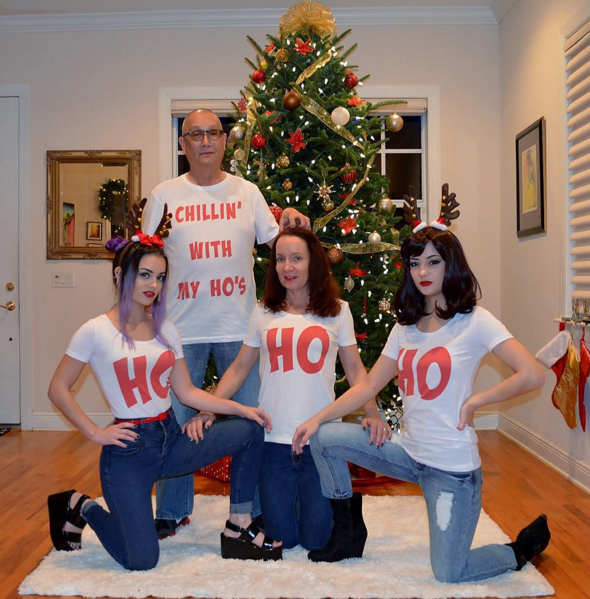 It seems that some people find the idea of a dad donning a 'Chillin' with my ho's' top, while his wife and two daughters sport T-shirts bearing the legend 'Ho', a touch creepy. Do you find this funny or disturbing? 3. Does changing the positions change your mind? 4. The family aren't strangers to social media - both daughters have 5,000-plus followers on Instagram, and they regularly post scantily clad photos of themselves. Would you post something like this of your family?